Born in Buenos Aires, Argentina, raised in West Hartford, Connecticut and an alumna of Tufts University near Boston, Cecilia will return to her native land for a two-week sojourn in August. She’s looking forward to the trip immensely, especially for the chance to visit family, including a toddler godson; however, she dislikes that the trip will take place during Argentina’s winter. 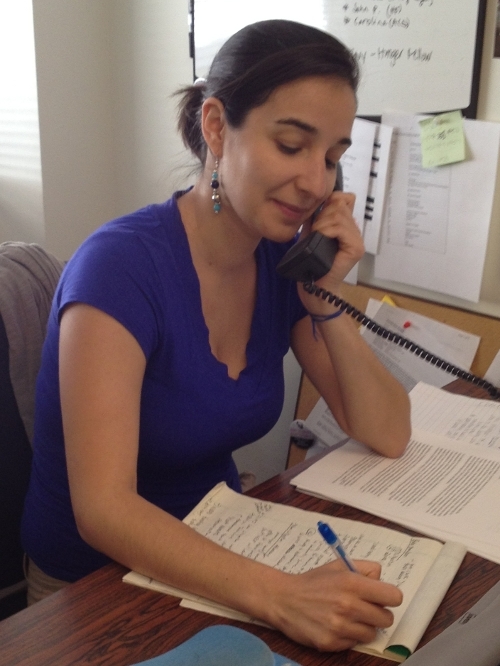 Cecilia joined the Law Center eight months ago, in October 2011, but she is not in entirely new territory. She worked previously in the District with Law Center Legal Director Karen Cunningham, at Washington Empowered Against Violence (WEAVE). In fact, Karen was her supervisor. Cecilia is not without interpersonal interaction at the Law Center, though. In particular, she loves overseeing and getting to know its rotating cast of interns (including this one). Finally, although she professes a hatred for exercising, Cecilia is commonly spotted exiting the office in the evening with yoga mat in tow, en route to a power flow class. While she “dabbled” in yoga over the years, she is proud to have maintained a consistent practice since January. It keeps her grounded as she does her part to address homelessness and poverty. This entry was posted in Domestic Violence and tagged direct services, staff. Bookmark the permalink.